UPDATE: this post is a combination of a few smaller posts that were knocking around from the early days of K.W.N. As these posts contained excellent information on rainwater harvesting and filtering, I have compiled them here in one larger post. I stumbled across this diagram a while back. Unfortunately, I was unable find the original source or any further details on materials and construction. However, all is not lost as the diagram pretty much shows you all you need to know to collect and store rainwater at home. Includes fixtures and fittings. It shouldn’t be too difficult to replicate this system using just the diagram. Bio-sand filters remove pathogens and suspended solids through a combination of biological and physical processes that take place in the biolayer and within the sand column. BSFs have been shown to remove 5.00-64.00% of heavy metals and 90.00-99.99% of turbidity and contaminants such as bacteria, viruses, and protozoa. Above is a large homemade biosand water filter system from Instructables. If you head over to Instructables, there is a very in depth, step-by-step tutorial explaining how to build this DIY biosand filter, plus a load of information on why biosand filter are incredibly effective at filtering water. The best bit, is the whole tutorial can be saved/downloaded in a PDF document, making it easy to print out and refer to whilst. If you have the space and your local County allows it, I think everyone should install a simple rain collection system. You would be amazed at how much water you can collect from the roof of your house or a shed/barn. You are pretty much only limited by the space you have to store the collected water. If you have lots of space, you could easily capture enough water for watering your garden and any fruit and vegetables you grow. Harvested rainwater isn’t really great to drink, but if you are without your main water supply for whatever reason, it is feasible to use a survival/camping water filter such as this water filter to filter this water and make it safe for drinking. 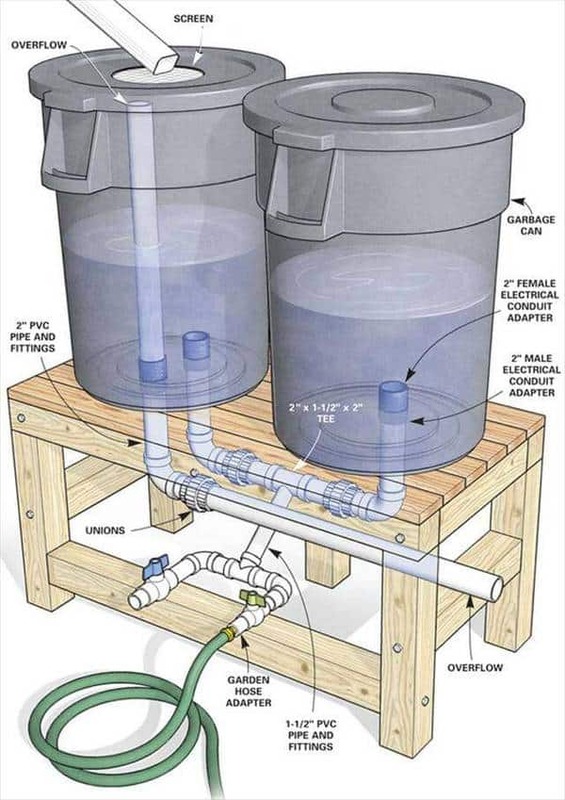 If you’d like more information about building a rain water collection system, the folks over at Old World Garden Farms have built a great system and they have written an article about how it was put together and how it works. Check it out below. For emergency drinking water storage, check out: WaterBOB WB-06-001 Emergency Drinking Water Storage it fits in your bathtub and holds 100 gallons of water.